President Trump says “[t]here is a chance that we could end up having a major, major conflict with North Korea.” The comments, which were made to Reuters in an interview, come two days after senior members of his administration, in a joint statement, tried to defuse tensions with the communist state, saying the U.S. remained open to talks. Trump suggested in the interview that while he would “love to solve things diplomatically … it’s very difficult.” The subject of North Korea’s nuclear-weapons program has been a U.S. priority since at least the Clinton administration—though efforts to denuclearize the Korean peninsula began during the George H.W. Bush administration. But despite bilateral and multilateral diplomatic efforts undertaken by Presidents Bill Clinton, George W. Bush, and Barack Obama, North Korea’s nuclear technology has improved, and many experts believe that it could be capable of firing a nuclear-armed missile that could reach Seattle in the next few years. North Korea’s recent missile tests, which are in violation of its international obligations, coupled with its nuclear program, have angered the Trump administration. It prompted Rex Tillerson, the U.S. secretary of state, to say as recently as six weeks ago that the U.S. would not talk to North Korea until it renounced nuclear weapons; Vice President Mike Pence to declare as over the Obama-era policy of “strategic patience” with North Korea; and to warn Pyongyang “not to test [Trump’s] resolve” after the U.S. fired missiles at a target in Syria in response to a chemical-weapons attack by the Assad regime and dropped the “mother of all bombs” against ISIS in Afghanistan. That language fueled speculation that the U.S. was preparing for a military operation against North Korea. But earlier this week, Admiral Harry Harris, the head of U.S. Pacific Command, told the House Armed Services Committee the U.S. should act appropriately “in order to bring Kim Jong-Un to his senses, not his knees.” Those remarks were followed by the joint statement from Tillerson, Secretary of Defense James Mattis, and Director of National Intelligence Dan Coats. Amid the tensions, the U.S. has also tried to assuage the concerns of its two main allies in the region, South Korea and Japan, both of which are seen as possible targets of any North Korean aggression. The U.S. has sent an aircraft carrier and a nuclear submarine to the region. Earlier this week, the U.S. military began moving parts of the Terminal High Altitude Area Defense (THAAD) system to South Korea. The U.S. and South Korea say THAAD is meant to deter North Korea, which routinely fires missiles that are capable of hitting targets in the South. The system is expected to be operational by the end of this year. Trump, in his Reuters interview, said he wanted the South to pay $1 billion for the system. 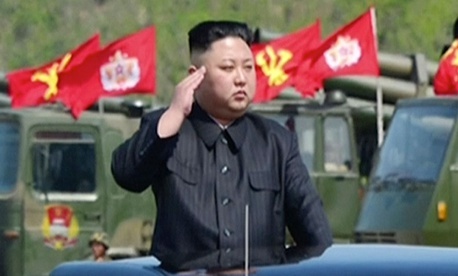 China maintains that it has less influence in North Korea than is believed. But Beijing is also concerned that a destabilized North Korea would result in direct consequences for China. Tillerson told Fox News that China had threatened North Korea with sanctions if Pyongyang conducted another nuclear test. Separately, he told NPR the U.S. was willing to hold direct talks with North Korea. Trump also said he hoped Kim Jong Un, the North Korean leader, was a rational actor, and appeared sympathetic to Kim’s assumption of power in 2012 after the death of his father, Kim Jong Il.